It’s not every day a band sells out all of the dates on their month-long North American tour, especially before they release a full length album. That is the hold that Greta Van Fleet’s music currently has on listeners. The band is out on the road, touring in support of their double EP set, From the Fires, and winning over fans one-by-one along the way. On a rainy, gloomy evening on the Lower East Side in New York City, the Bowery Ballroom was buzzing with Greta Van Fleet fans for the first of two sold out shows. As the doors opened to the main floor, a stampede race to the front of the stage ensued. The hometown boys in Caverns kicked off the night with a lively performance including their newest track “Times Is Hard.” This modern rock band has old school rock influences mirroring those of Greta Van Fleet, making them a perfect supporting act for the show. 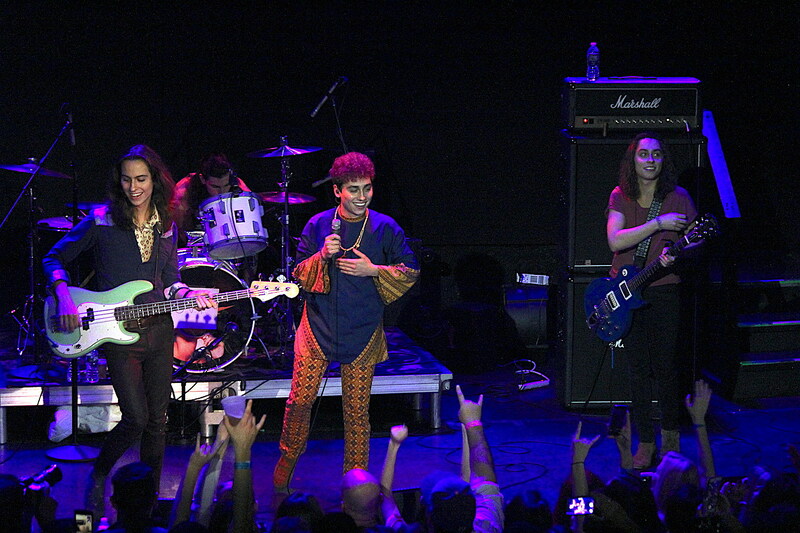 One of the best Greta Van Fleet songs on the new double EP and a highlight of the night was their performance of “Edge of Darkness.” From the first line, “Every day’s a new day / Every way’s a new way / On the edge of darkness / Finding out what it means to love,” vocalist Josh Kiszka’s commanding voice felt like a chilling medley of the spirits of rock greats that came before him. Doomy, mid-tempo guitar licks and deep bass lines provided by fellow brothers Jake and Sam Kiszka echoed throughout Bowery Ballroom. There was a serious guitar jam at the end of the song as Jake Kiszka pulled a Zakk Wylde move, shredding to the heavens behind his back. But don’t get it twisted, Greta Van Fleet are not some Led Zeppelin imitation or cover band. Their music is raw, primitive, psychedelic and disorienting in the best way possible. Another notable moments of the set was when they got their blues on with their cover of Howlin Wolf’s “Evil Is Goin’ On” and fans loved every bit of it. Greta Van Fleet does not have the smooth moves of groove riders like Crobot or killer beards like Blackberry Smoke but they have a sound that commanded everyone in Bowery Ballroom. Don’t be surprised if/when the band fills Madison Square Garden or Barclays Center later in their career. The penultimate song of the night was the one that started it all, the addictive anthem and one of the best rock songs of the year, “Highway Tune.” The encore then led into the last song of the night, the catchy “Safari Song” filled with a serious drum solo by Danny Wagner, twangy guitar riffs and vocal wails evocative of rock’s most notable frontmen (besides Robert Plant) like Axl Rose of Guns N’ Roses, Bon Scott of AC/DC and Mick Jagger of the Stones just to name a few. If you haven’t gotten a ticket to their sold out tour, there’s always next year. For Greta Van Fleet and their fans, 2018 holds great promise with more touring and the hope of a full-length release. Check out our gallery of photos from Greta Van Fleet’s Bowery Ballroom show in New York below.